Rap Weekend, spring 1971, Fresno California. In our studio we hosted a weekend of performances and exhibited work to a large group of both local and out of town visitors. 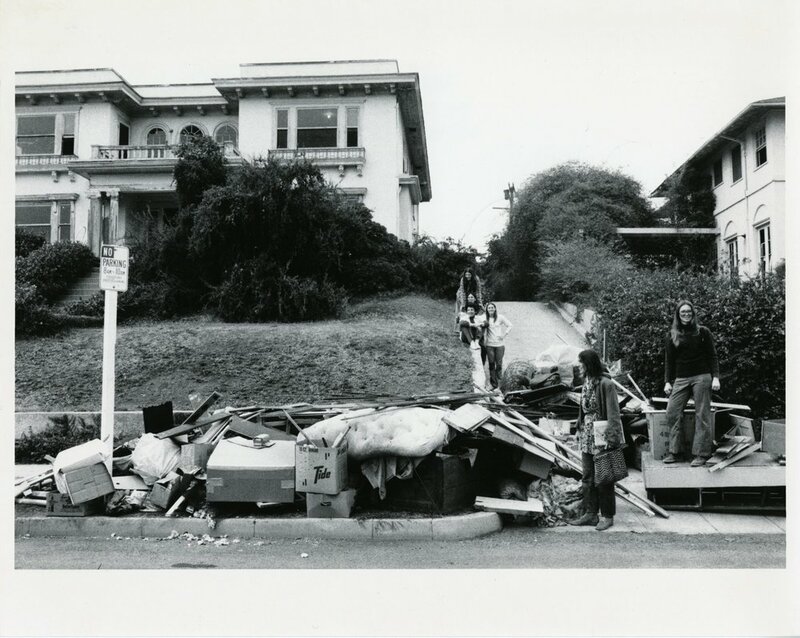 In the first year of the Feminist Art Program in Fresno, California (1970-71), a small group of us worked collaboratively with “costume” images. The group consisted of myself; Janice Lester, Dori Atlantis, Shawnee Wollenman, and whomever we could talk into letting us dress them up. We had the privacy of an off-campus studio. Judy Chicago was very encouraging. She taught us to push ourselves beyond what we thought we could do and exposed us to the professional side of art making. We got better cameras, used backdrop paper and refined our images. We were investigating the various roles and visual images of women. The following images are a sample of what we did. The following information is from the book By Our Own Hands, The History of the Women Artist’s Movement in Southern California, 1970-1976 by Faith Wilding, published by Double X,, Santa Monica, California, 1977. 1. Building a female context and environment: The women rented an old community theatre building off-campus, which they remodeled to suit their needs. This gave them the opportunity to build a separate place which they controlled and in which they could evaluated themselves and their experiences without defensiveness and male interference. They also learned vital building and organizing skills and became a strong cohesive group. 2. Female role models: Women have always lacked positive female models in educational institutions. Role models were supplied by Judy Chicago and by research and reading in female art history, mythology, literature and culture. 3. Permission to be themselves and encouragement to make art out of their own experience as women: This opened up a whole new world of possibilities to the students and paved the way for a new feminist art. Although much of what was happening in the Program was as new to Chicago as it was to the students, she performed a leading and vital role by making great demands on them and setting the aspirations for achievement very high. Since the Program was the first of its kind anywhere in the country, the women felt a special sense of risk and importance and a freedom from history, which made them adventurous in their experimentation. Many years later, the activities and discoveries of the Fresno Feminist Program are still an inspiration to those who hear about them. Its importance in the pioneering of feminist art education and art making is firmly established in the history of the women’s art movement. Students and faculty of the program at Cal-Arts worked together and transformed an abandoned mansion into an environment reflecting the dreams, ideas and emotions of women. 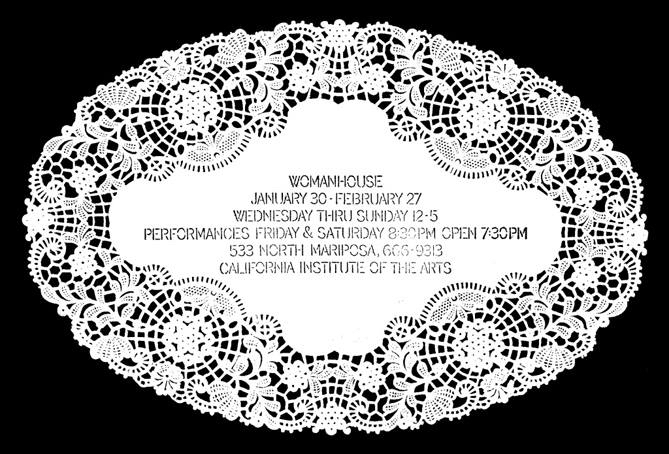 Related performances were presented during the exhibition of Womanhouse, January 21 - February 27, 1972. This collaborative project received international media attention and been covered in numerous books as well as a documentary film that was made by Johanna Demitracas. Karen LeCocq and I collaborated on Lea’s Room. We transformed one of the upstairs bedrooms into an elaborate antique filled haven that was inspired by the character Lea, an aging courtesan in a novel by Colette. On Friday and Saturday evenings during the month that Womahouse was open, Karen sat at the make-up table and applied make-up, layer after layer—acting out the anguish that women can go through to present a “face” to the world.